Girls Scooters Offer Fun and Exercise! Girls’ scooters are made in colors and designs that girls love! A scooter reminds me a little of a thin skateboard, but you have the handle bar to hold onto, making it a bit more comfortable and safe. The video on this page shows some cool moves you can make on a scooter. Your daughter will enjoy taking hers out and riding on the sidewalk or playing at a park that has a skateboard area or a large open concrete area. Scooters are terrific ways for girls to get out and enjoy the great outdoors while getting exercise along the way. She will enjoy learning fun moves and tricks, as well as riding to a neighbor’s house a few blocks over. Girls of all ages enjoy riding scooters. There are special models for young girls and those just starting out, and there are nice, deluxe models for more advanced riders and older girls. This little scooter for girls offers a lot! 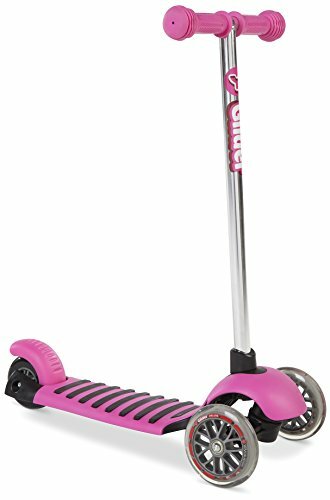 It has a case attached on the handle bar that will hold an MP3 player, and keep it protected, so your child can listen to her favorite music while scooting around town. The wide contoured deck is stylish and safe, and there is a foot brake for added control. The handle bar is adjustable to fit multiple heights, so it will grow with your child. The first two scooters shown here might appeal to younger girls, while the second two are ideal for older girls, up to age 15. Any of them are stylish choices in designs girls love, and your daughter will enjoy scooting about on any of these options. Click on photos for details and pricing. Perfect for first time riders, this kid-powered mini scooter features a stylish deck upgrade from our Y Glider. With raised molded anti-slip grips on the deck, our unique ‘Lean to Steer’ method of steering, and easy stop rear wheel brake, the Y Glider Deluxe allows kids as young as 2 years old to enjoy scooting at their developmental stage. Used indoors or outdoors, the Y Glider Deluxe helps children develop their critical balance and coordination skills. Kids love the independence this gives them and parents love the safe and simple design of this cool little scooter. 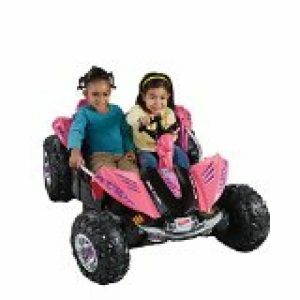 These deluxe scooters for girls come in a variety of styles. The first one has handle bars similar to a bicycle, and the design also resembles a bicycle. The third scooter shown here has a seat and is electric! This is ideal for girls who are unable to be overly active. The fourth scooter is a 3-wheeled scooter offering a fun and unique way to ride. Click on each photo for more details and pricing. Disney Frozen products are very popular with girls! 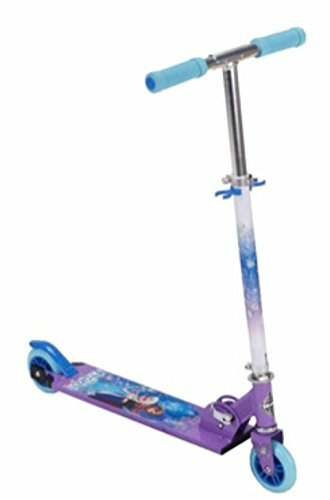 This pretty lavender and aqua colored inline scooter is just what girls want! It features Frozen characters whom they love, and they will be proud and excited to take this scooter out and show it off to friends! Toddlers and young girls can ride a scooter with ease, when you start them out with a beginner’s model. These scooters are wider and made especially for young riders. They are easy to maneuver, too. 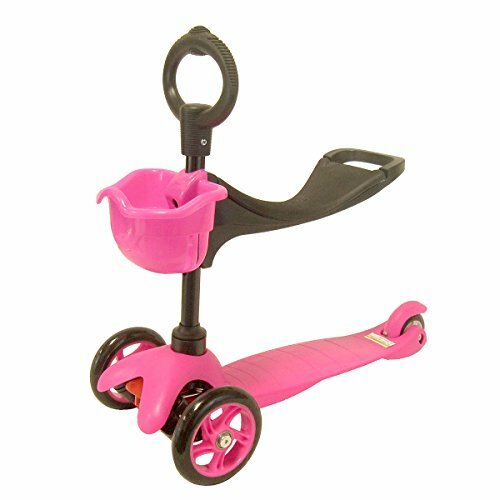 Little girls will love the colors and designs of these easy scooters! Click on photos for details and pricing. Young kids can glide and ride down any hard surface on this fun, safe 3-in-1 scooter. Built of solid, high quality metal and plastic, the sleek, colorful design and easy function provide hours of active fun. It features a removable seat and basket, a loop handle, and a T-bar handle. Younger kids can use the seat feature to practice balance, and can then switch to the loop or T-bar handle once their skill improves. The unique wheel mechanism allows kids to steer in any direction just by leaning. For ages 3 to 5 (42 lbs. and less), promotes coordination, balance, and active play.